The law/demand to measure up to Michael Jordan (the Jordan Rules), as we mentioned in a post about LeBron James, is as incredibly pervasive and as it is inflexible. Like all laws, there’s no wiggle room (i.e. the “jot or tittle” of Matthew 5:18). The law wouldn’t be the law if it were any less rigid. Once a player is put under the demands of the Jordan Rules, they only have two options for response: meet the demands (perfectly) or be freed from the demands. LeBron has experienced the latter option. Which approach has Kobe taken? In Luke 18, Jesus tells a parable about a Pharisee and a tax collector. The Pharisee looks at the wretched tax collector and thanks God that he "is not like other men." 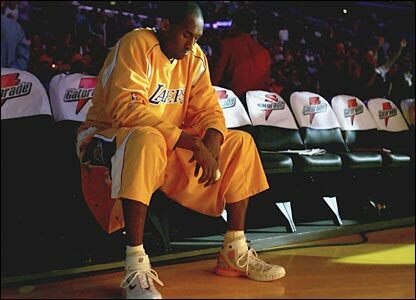 Kobe seems to have chosen this role for himself, accepting all the pressure that comes with being a special case. Just this week, on the first day of training camp, Kobe loudly claimed that the new look Lakers are "his team," despite the presence of several multi-selection All-Stars, shoveling another helping of pressure onto his already overflowing bowl. LeBron is more like the tax collector, who beats his breast and asks God to forgive him. LeBron has apologized for the arrogant press conference in which he announced that he was leaving Cleveland and has assumed a team leadership given (by Dwyane Wade), rather than demanded. Kobe has been compared to Jordan since his rookie season— and the comparisons have only escalated as Bryant accumulated championships. In response to the Jordan Rules, Kobe has taken the first approach: to measure up—and this has been the worst thing he could have done! As a result, the Jordan Rules have perpetually had their way with him. Now, Kobe isn’t viewed as any other individual player—he’s viewed through the merciless lens of the Jordan Rules, which inevitably expose Kobe’s failures and inability to uphold the demands and measure up to the Greatest of All-Time. The Jordan Rules strip Kobe of his individuality as a player—he’s just another shooting guard in the shadow of Michael Jordan. In short, Kobe has never cried “Uncle” under the pressure of the Jordan Rules. But what if he did? Should he? We're not saying whether he should or shouldn’t "back down" from the challenge to measure up to MJ, in part because Kobe’s competitiveness is certainly entertaining, and therefore good for the NBA, but we are saying that, for his own peace of mind and personal legacy, continuing to try to "be like Mike" is the worst thing he can do. The law makes him a Jordan copycat who, at best, is just a pale comparison. When Kobe won his 5th championship in 2010, the initial reaction wasn't fully celebratory. 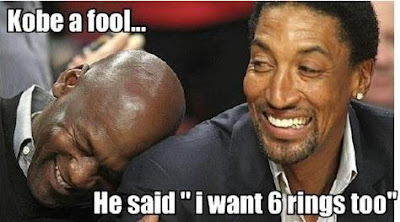 We could feel the demands to "Be Like Mike" in the background saying, "Jordan had 6 rings. Kobe’s got one more to go." Just cry “Uncle”, Kobe, and drink some Gatorade! This post is a collaboration between Nick and friend Matt Patrick. Visit his blog HERE.